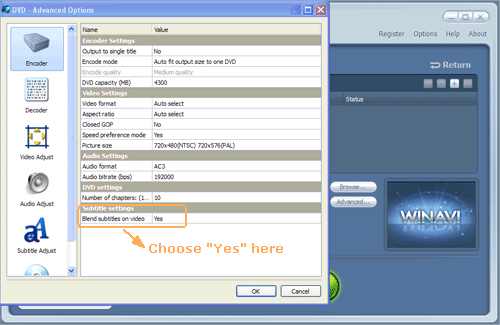 This tutorial shows you the detailed steps to add subtitle to DVD with WinAVI All In One Converter. First of all, you should prepare a video file, subtitle files and a video converter. And here we take WinAVI All In One Converter for example. In addition, if you have your favourite movie and wanna convert to DVD with your language subtitles, all you need to do is to download a WinAVI Converter and download subtitles from Internet or edit subtitles at first and then add subtitle to DVD during the DVD conversion process. The popular file extension of subtitle formats are.srt and .ssa. You can easily see the contents of the subtitle through any text editor such as notepad. Step1: please put your .srt or .ssa subtitle file into the same folder with movies you want to convert together. Setp2: You must rename the .srt or .ssa file to match the original video name. Make sure the subtitle name set as"file name. language.srt/ssa". For example, If you want to add a subtittle into an English movie such as "Shrek", you should set your subtitle as "Shrek.en.srt" or "Shrek.en.ssa". In this process, please also distinguish the capital and small letter. Step3: If your converter program is running, please shut down and restart it. Then click"Advanced" and enter the "Decoder" Menu, a "subtitle stream" option will be showed for you. 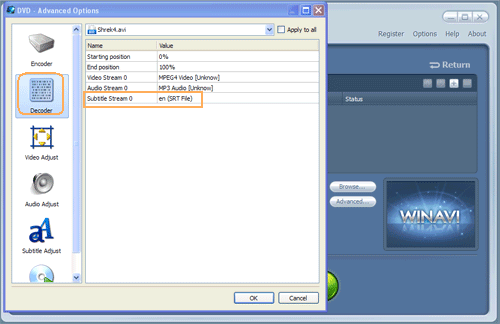 Step4: Set "Yes" for "Blend subtitle on video" option on "Encoder" menu. 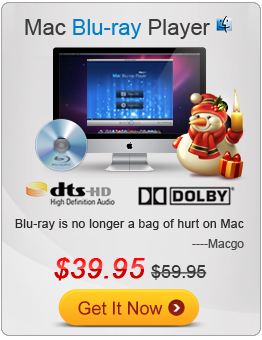 Then you can convert files with the subtitle you have added to DVD.